Lambda Monoclonal Trays | Delta Laboratory Co.,Ltd. 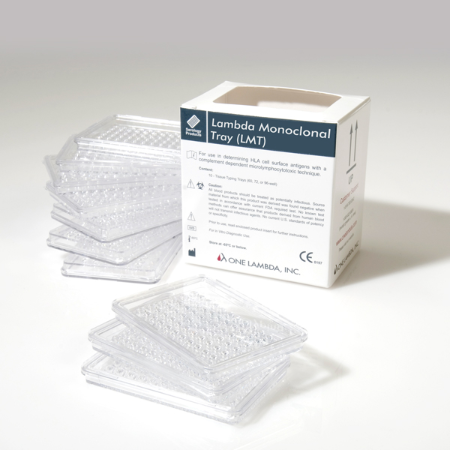 Lambda Monoclonal Trays – a One Lambda exclusive, are extremely dependable for determining HLA Class I or Class II antigens. Each tray is comprised exclusively of monoclonal antibodies, rather than human anti-serum, and has both positive and negative controls and will accommodate most CDC methods. They are designed for use with both staining techniques−dye exclusion and fluorescence. Fast Monoclonal Trays (FMT) save test time by using B-cells for both Class I and Class II phenotyping. LMT Class I and Class II Typing Trays feature a pre-mix of monoclonal antibodies and complement in each well, supplying a consistent uniform mixture of reagents throughout the array. The mix provides a shorter test time, fewer variations between lots and a higher level of consistency and accuracy in the typing results.